Hydrangea is a widespread ornamental plant in landscaping. Today there are more than 35 kinds of this bush. The hydrangea is loved not only by designers, but also by many gardeners. After all, this plant blossoms rather beautifully till late fall. 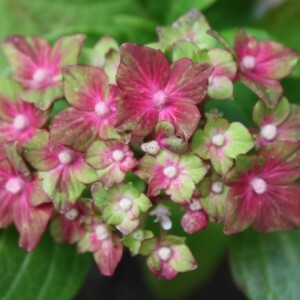 The outdoor blossoming of a hydrangea is the share of the second half of summer when at the majority of other ornamental plants the blossoming period already comes to the end. There are a lot of inflorescences on bushes, they long keep and are ideally suited for cutting. Leaves of a bush have an oval form, they large and wrinkled. The form of inflorescences can be umbrella-shaped or spherical. In the center of a flower there is a small ball, consisting of four petals with the rudiments of pestles and stamens which are inside. Hydrangea cultivation. All about plant.